So I am working on reviews from last season, but it’s very on-off, not helped by varying distractions (Dark Souls 3 DLC, card games, Persona 5 soon enough, etc.). It was a good season though! Rakugo S2, Gabriel DropOut, Kobayashi’s Dragon Maid, the end of 3-gatsu no Lion (S2 hype! ), and the starts of Little Witch Academia and KiraKira Precure A La Mode! This season has actually already started, so I’m a bit late to the party on this (it snuck on me – technically speaking, the winter season hasn’t finished yet! 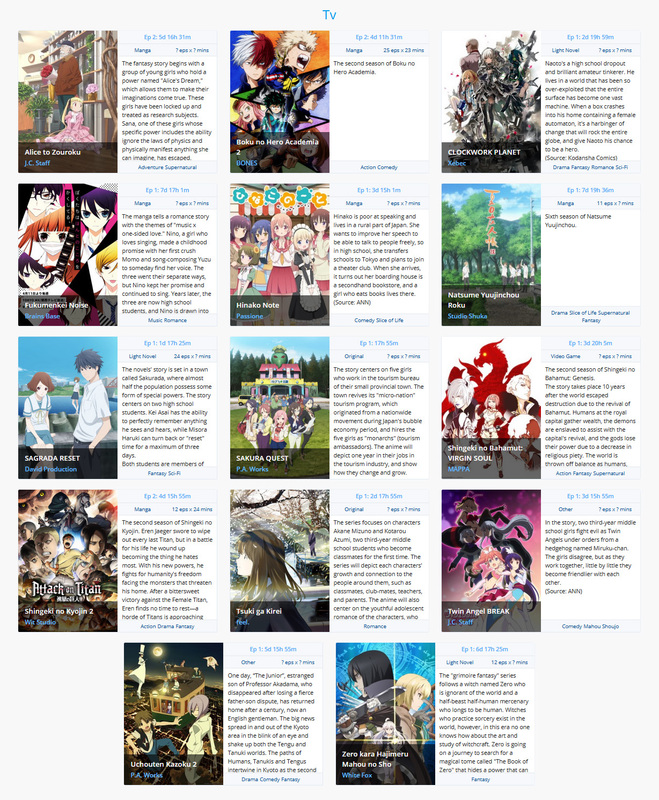 ), but aside from the first episodes of arguably the 2 biggest shows of the season there’s nothing much to talk about. Something tells me that this will be a season with few real surprises, mostly because the most anticipated shows are sequels and thus represent a somewhat known quantity. Alice to Zouroku is one of the shows that I’ve already watched at the time of writing and its first episode was… alright? There’s a lot that just feels sloppy and clunky – the writing is kinda weak, the premise as presented (Magical children that are experimental test subjects! The most dangerous one escapes! A reluctant citizen takes her in!) is hardly original or impressive, and the production quality is dire (the extended CG car chase/action sequence was absolutely dire) – but nonetheless I can’t help but feel there’s a glimmer of potential. Mostly in that the crotchety old man is a florist – it’s a very strong contrast to his personality, and the presentation of that and various elements around it was done rather well. Based off the promo art I was hoping for something closer to, say Ikoku Meiro no Croisée, and this is far from that, but there might be a little bit in there like that. While I never wrote a review for My Hero Academia, I freaking loved it to bits and it was one of my favourite series from last year. There’s something so stunningly life-affirming about its story, so refreshing about its take on superheroes, and so charming about its cast that I just couldn’t help but fall in love. The first episode has aired and while it was a bit of a catch up on the first season, it looks like season 2 is more of the same in the best way possible. “Hell yeah, clockpunk!” is pretty much my only thought going into Clockwork Planet, and that still largely holds even though the PV indicates that it’s not quite as clockpunk as I was hoping. I’m approaching this with caution as it is a light novel adaptation, but the PV also made it look less, uh, light-novel-y. “Music” and “romance” is a genre combination that I’ll inevitably check out despite having no established reason to do so; it really is just “two things wot I like”. This burned me last season with Fuuka which I dropped after an anger-inducing first episode (and by all accounts didn’t get better), but I’m hoping for more out of Fukumenkei Noise! Not for any positive reason; Fuuka just set the bar that low. Hinako Note is the mandatory moe fluff show of the season so obviously I’m watching it. Natsume Yuujinchou Roku is the 6th season of Natsume Yuujinchou and that’s all you really need to know about it. Season 5 was pleasant enough, not quite to the standard of the ones preceding it and mired by production issues, but still perfectly good (is Natsume Yuujinchou capable of being bad?). I hope season 6 is a return to form! Sagrada Reset has an interesting premise. In a town where almost half the population have special powers, two high schoolers have powers that synergise really well. The dude can perfectly remember anything, and the girl can turn back time three days – and the dude’s memory remains. They are part of the school’s ‘service club’ which keeps an eye on things, and they use their powers to help with that. The issue is that the premise then goes on to include a discover of a ‘macguffin stone’ (yes, that’s the name) that is extremely important or something. idk. The name of the stone could hint towards delicious self-awareness, or could just be ‘self-aware’ in the “we’re aware this is bad but if we act like we’re self-aware then it’s not bad anymore”. Also it’s a light novel adaptation – who knows how it’ll turn out. P.A. Works are at it again with Sakura Quest. Five girls work in the tourism bureau of their small town. Shenanigans, I assume, ensue. Might be alright – it’s an original, so there’s that. You know what was real damn good? Shingeki no Bahamut: Genesis. You know what deserved a sequel? Shingeki no Bahamut: Genesis. You know what Shingeki no Bahamut: Virgin Soul is a sequel to? Damn straight it’s Shingeki no Bahamut: Genesis! The more of Favaro and Kaiser’s nonsense we get, the better! I’m a little concerned as I remember the first season ending somewhat definitively, but it was still a great time and as long as it can deliver that I’ll be happy. The third and final series that has already started and inarguably the ‘big’ anime of the season, Attack on Titan S2. I’ve gotta say, after the first episode I’m not really feeling it. Not because it’s suddenly worse or anything, but because I think I had my fill of it the first time around, and on the three and a half years since season 1 my tastes and attitudes have shifted. I was struck by how ridiculous all the bombast was when it was also so resolutely po-faced and deathly serious, and just how dull the relentless, monotonous grimness was. And honestly, I don’t think I care to want to see people be eaten alive slowly and painfully. I’ll watch another episode or two, but I won’t be surprised if this ends up dropped. Tsuki ga Kirei is an original romance series with an official synopsis that says absolutely nothing. They’re in middle school, they will grow and connect with others, blah blah blah. Literally nothing as any kind of hook, just aspirations to quality writing. But – it’s original, and the promo art looks nice. Twin Angel Break is a comedy magical girl series coming out of J.C. Staff. That is a bit concerning right off the bat, but from what available materials I’ve seen (mostly the first half of the OP) it doesn’t look hugely skeevy. If that’s the case, it could be some harmless goofy fun! The series my twitter timeline as a collective is most excited for (it comes second to My Hero Academia S2 for me) is Eccentric Family 2. Eccentric Family was a quirky, fantastical and mundane series about family and fascination wrapped up in a story about tanuki in modern Japan. It was incredibly enjoyable with a lot of subtlety and nuance behind it, and I am really looking forward to more. Assuming they can deliver in the same way they did with S1, of course. Either way, as long as we get to explore Benten more then I’ll be more than happy. And finally, Zero kara Hajimeru Mahou no Sho. Another light novel adaptation that doesn’t appear to fall into the trappings so commonly associated with the medium, it follows a witch named Zero and a half-beast, half-human mercenary who longs to be human. Sorcery exists but witchcraft has fallen into obscurity. They journey together as she looks for “The Book of Zero” which has power enough to destroy the world. Already, not a bad setup – fantasy odd couples journeying together is always promising, although it will inevitably invite comparison to Spice & Wolf – so I’m excited to see how this one turns out. So that makes a grand total of 14 new series with Little Witch Academia and Kirakira Precure A La Mode carrying over, making for 16 this season. Five of these new ones are sequels though, so I can’t say this is an exciting season because a huge core of it is such a known quantity. At the very least, that means I’ve got a solid handful I can be reasonably sure I can rely on, and hopefully there are some pleasant surprises lurking among the rest of them!